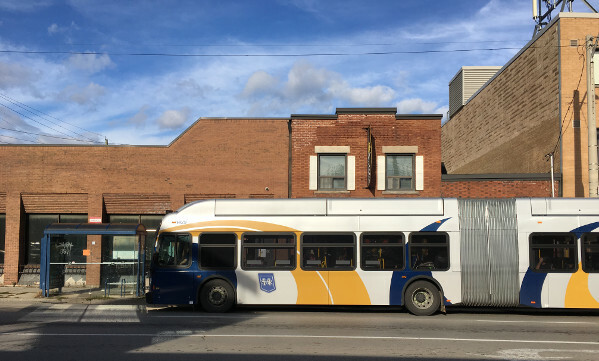 The Hamilton Street Railway (HSR) is Hamilton’s transit agency operating its many bus routes. Since the late 1980s, ridership growth on the HSR has stagnated due to decades of transit underfunding by the city. In 2013, ridership was 75 percent of what it was in the late ’80s when HSR had 50 percent more buses on the road. The few routes with high levels of service have had, and continue to have, high ridership, confirming a relationship long known in the transit industry. In 2006, the Province created a regional transit planning agency for the Greater Toronto and Hamilton Area (GTHA) that adopted the name Metrolinx in 2007. GO Transit was merged into Metrolinx in 2009. Municipalities in the GTHA were asked to put forward major transit initiatives for funding by the Province. 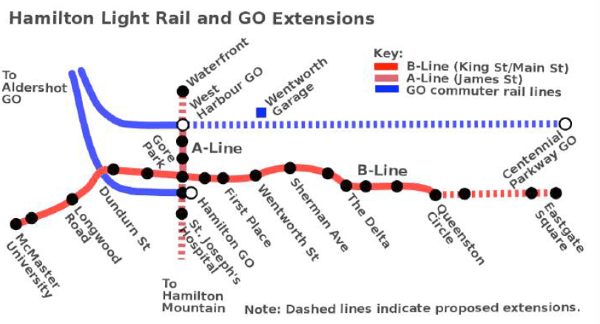 Hamilton’s Transportation Master Plan of 2007 led to a proposed five-line LRT network with Hamilton putting forward its downtown east-west LRT (B-Line) as its highest priority, to be followed by a north-south LRT line that would connect downtown Hamilton to the part of the city on the Mountain (A-Line). Detailed planning for light rail in Hamilton began with substantial public consultations. A great deal of public support developed during this process. LRT was pictured as more than just higher order rapid transit; it would stimulate revitalization of Hamilton’s downtown and other neighbourhoods along the route. A Metrolinx Benefits Case Analysis of the B-Line LRT was positive. Environmental assessment was concluded in 2011 and the LRT was ready for provincial funding. In 2011, Hamilton’s LRT project was put into suspended animation by then-Mayor Bob Bratina, elected in the fall of 2010. Bratina represented to the Province that the city’s priority was all-day two-way GO train service, not LRT, with the Province responding by moving Hamilton’s LRT down in the Metrolinx priority list. Hamilton’s city manager suspended the Rapid Transit Office and established a new team to focus on getting all-day GO rail service. Delayed construction of LRT had the consequence of giving opponents opportunities to undermine the project, to the distress of the many citizens who had energetically supported it. Though the new West Harbour GO station opened in July, 2015, just west of the old James Street North GO station it replaced, there still is no all-day two-way GO train service to the city. In January 2013, Kathleen Wynne became leader of the Ontario Liberal Party, becoming Premier and continuing as Premier with the Liberal election victory in June 2014. In the municipal elections of October 2014, Fred Eisenberger was elected Mayor of Hamilton, having perviously been Mayor between 2006 and 2010. Eisenberger went to bat for LRT and, in May 2015, the Province announced $1 billion in funding for the Hamilton’s B-Line LRT. Because it is entirely funded by the province, the B-Line project is in the hands of Metrolinx. The project has been modified, with the east end of the route cut back from Eastgate Square to Queenston Circle. Instead, there will be a branch off King Street on James Street North to the West Harbour GO station, a segment of the proposed A-Line LRT. Part of the funds allocated to Hamilton will also be used for a brand new Centennial Parkway GO station in Stoney Creek 9 km east of James Street on the CN railway line to Niagara Falls. HSR will need a garage facility for its 14 light rail vehicles. A likely candidate is a former relatively modern bus garage on Wentworth Street North at the CN rail line, now a City Public Works Department facility. With modifications, this facility has indoor space to accommodate HSR’s LRT fleet. Using this location would require about 2 km of connecting track. In December 2015, Paul Johnson became director of LRT coordination for the City of Hamilton. He is working to expedite LRT construction, starting with utility removal and/or replacement. As in Kitchener-Waterloo, the construction of the project will be a P3. Contract tendering will occur in 2017, with construction to start in 2019, completion being in 2024. Johnson has indicated that the A-Line segment to the West Harbour GO station is now being more fully studied. Other parallel streets just either side of James Street may get the track. There may also be room in the budget to take this branch to Waterfront. 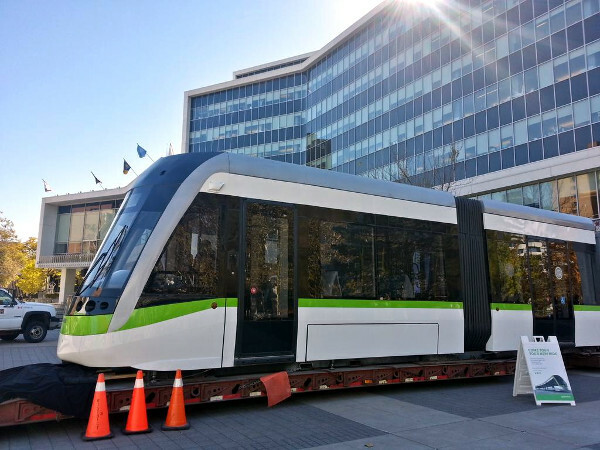 With Brampton rejecting an LRT line through its downtown in October 2015, some Hamiltonians are hoping these unspent funds might move to Hamilton. They could be applied to extend the B-Line to Eastgate Square as originally planned, or to extend the A-Line to Waterfront and/or St. Joseph’s hospital on James Street South. While the LRT drama has had a happy ending, drama still surrounds Hamilton’s bus-based transit system, in decline for 30 years. Comparable transit systems across Canada have grown ridership by expanding service frequencies and routes. By contrast, City Council in Hamilton has a closed wallet for transit expansion. It appears to have adopted an unofficial policy of refusing to put more city tax dollars into transit, instead relying on fare increases (which can be counterproductive) and extra money from the Province. In November 2014, David Dixon, formerly an operations manager with the TTC, became the new director of the HSR. As someone finally willing to push a transit agenda in Steeltown, his arrival in that post was viewed by many Hamilton transit advocates as a breath of fresh air. Dixon delivered a Ten-Year Transit Strategy [PDF], adopted by City Council in March 2015. The plan was growth-oriented, but Dixon did not ask Council to dip into its municipal pockets. The plan included fare increases sufficient to provide some new buses and additional drivers. More ambitiously, it called for increased service, especially on routes that have been identified for future LRT. LRT supporters were stunned by this new grant request, which was perceived as putting LRT funding by the Province at risk. But Transportation Minister Steven Del Duca quickly threw cold water on another handout to Hamilton, stating that, instead, Hamilton should make use of the gas tax refund monies that are returned to municipalities across the Province on an annual basis. In January 2015, Hamilton city council voted to end a transit-only bus lane through downtown Hamilton, a pilot project funded by Metrolinx in October 2013. The vote was 9 in favour of closing the bus lanes to 7 against. The Councillors from wards in which the bus-lane operated supported keeping it. The HSR Ten-Year Transit Strategy, which Council approved, includes extensive use of transit-only lanes. The way forward for the Ten-Year Transit Strategy should be clear. The gas tax refund by the Province is a case in point. Close to 90 percent of the gas tax money is used for roads, whereas the program was originally intended to be a main source of paying for transit. Waterloo, for instance, uses half of its gas tax refund for transit. There is another tax anomaly working against transit expansion, a peculiar property tax policy that Hamilton has followed since amalgamation. 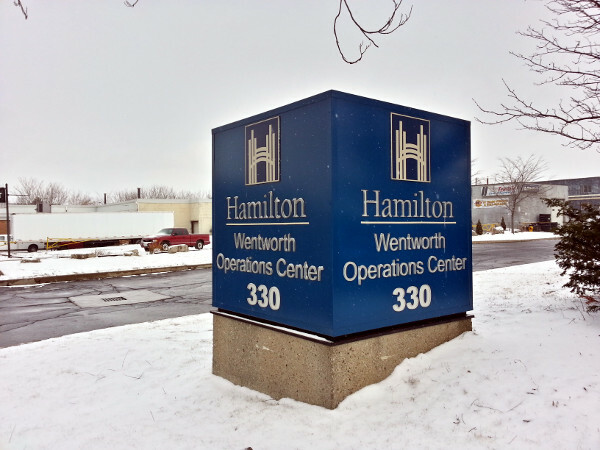 Amalgamated Hamilton includes the old high-density city, less dense suburban areas, and rural districts. The property tax includes a transit levy that varies according to location. The transit levy originally reflected the level of transit service in the city’s 17 designated areas. Today, ironically, one consequence is that low tax areas (suburbs) oppose transit expansion because their transit levy would go up with better transit. Critics point out that property taxes for a city’s services and programs ought not be a fee for service, but should rather reflect the cost of services and programs to everyone equally. Two citizen panels have recommended an end to area weighting for the transit levy. One option is a uniform tax rate with only rural areas being exempted. Transit is the only city service remaining with levies determined by area rating. The area rating system for transit funding and the lopsided use of the gas tax refund for roads are depriving the HSR of significant revenues it needs to augment service to reduce car-dependency by stimulating a modal shift to transit. The challenge for Hamilton is to finally fund transit at a level typical of most cities of its size, joining the trend to become more transit oriented.